Weddings are one of the most special days of a person’s life. 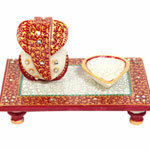 So it is very important for that person that everything on the day of the wedding goes smoothly, well and as planned. We want all our relatives and friends should attend our wedding to shower their best wishes & blessings before we begin our new life. And, marriage is one such occasion where couples are even showered with gifts as a token of blessing by all the relatives & friends. Imagine, how great it would be if we reciprocate this process by giving them return gifts, which can make them feel special and honoured. and can be a way of saying “thank you” to your guests. This says that you are also grateful that they came to your wedding and that their support and blessings are quite important to you. 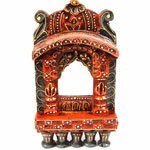 Lord Ganesha Handmade Gifts: This is one gift that will definitely be liked by all. You can find Ganesha Idols, chowki, pooja thalis, Chopra’s etc..It can cost you from RS 300/- to Rs 1500/- approx. Handmade Watch: This extremely beautiful decorative timepiece features a clock. 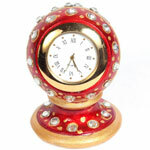 You can find Pillar watches, paper weight watch, wall clocks etc.. It can cost you from RS 400/- to Rs 1100/- approx. 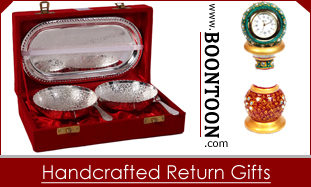 Candle Holder: You can go for different types of candle holders like ethnic oxidised, Tealight Candle Holders, Votive Candle Holders, Taper Candle Holders etc..It can cost you from RS 200/- to Rs 500/- approx. Photo Frames: There are different types of photo frames like wooden, glass, traditional jharokha style etc…Basically, it varies from Rs 300/- to Rs 2000/-, depends upon your choice and budget.